I suppose I should start off by explaining why it has been forever and a day since my last post. Right around Christmas we learned we are expecting baby number two (Yay!!) and this pregnancy has already proven to be nothing like my first. When I was pregnant with Jayden, I never got sick, I had an abundance of energy, and truly felt great for the majority of my pregnancy. Fast forward three years, and nothing is the same. Morning, afternoon, evening sickness, and the worst fatigue I've ever experienced. Hubby says it's because I'm older now, isn't that sweet?? This coupled with an extra hectic month and you have the reason for my long hiatus. 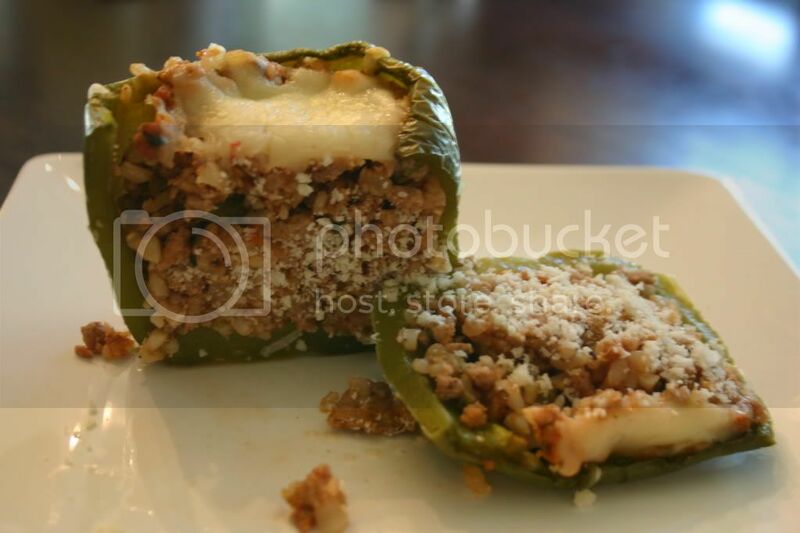 It's only fitting that my first post in a long while is stuffed peppers, because that is what I feel like these days- a stuffed pepper. Oh, didn't I mention that aside from being a more physically exhausting pregnancy, my second one also has me looking like I'm carrying quadruplets? Oh ya, I got it all this time. A few weeks ago, as I was approaching the 11 week mark, my wonderful hubby who always knows how to say the most comforting things, looked at me and said, " wow, you look like you did when you were 6 months pregnant with Jayden and you're only 3 months." Thanks a lot babe, thanks a lot. I guess he forgot how volatile a sickly pregnant woman can be- he was quickly reminded after that comment. The other fun part of this pregnancy that I didn't get to experience with the first pregnancy is the aversions and cravings for certain foods. My first time around, I never had those weird pregnancy cravings, nor did any food turn me off. This time however, I am finding it harder to eat the way I know I should be. Even my smoothies in the morning have a strange taste to them. That being said, it has been a struggle to plan out our daily meals and I know hubby is getting sick of having Mexican food every night. I have had to force myself to eat salad, which is usually my daily staple. Food just tastes different to me right now. Things I usually love I find unappetizing. And the things that sound good are the foods I know I shouldn't be eating, ones I haven't had in years, like french fries. Bring a large pot of water to a boil. Parboil the peppers until tender, about 2-3 minutes. Remove with a spider or slotted spoon and drain upside down on paper towels. In a large saute pan heat oil over medium high heat. Add onions and chopped bell peppers and cook until soft, about 4 minutes. Add turkey, garlic, parsley, red pepper flakes, salt, and pepper. Cook until meat is browned, breaking up lumps with a wooden spoon or spatula, about 8 minutes. Add the cooked rice, tomato sauce, and parmesan and stir. Remove from heat and adjust the seasoning to your taste. ( I always end up adding more salt and pepper). Pour enough water into a baking dish to just cover the bottom about 1/8" deep. Stuff the bell peppers with the meat mixture and place in baking dish. Bake 20 -25 minutes and remove from oven. Top with mozzarella cheese. Put back in oven for 5-10 minutes until cheese is melted. Remove from oven and let rest 10 minutes before serving. Serve as is or with your favorite hot sauce. I sometimes use fire roasted tomatoes in place of the tomato sauce. They lend a smoky flavor and a chunkier texture to the filling which I love. Experiment using both and find your favorite!